The largest ever gathering of games developers in North Wales will arrive at Wrexham Glyndŵr University next week. The Level Up Wales science, technology and gaming expo will take place in the Catrin Finch centre on the University’s Plas Coch Campus on May 31 and June 1. Both days will run between 10am and 5pm and will feature a wealth of games applications, products and related technology. Demos available during the day will include interactive games, virtual reality technology and programmes, and robots. A series of sessions giving an Introduction to Programming will also run throughout the day. There will also be a number of games competitions across both days with prizes to be won. Over the two day period the Wrexham Glyndŵr University game development team will be on hand throughout to provide games industry career and portfolio advice in addition to support for course information and applications. The University’s careers team will also be on hand to give guidance, as well as the Zone Enterprise team who work with the University’s incubation centre, the Enterprise Lounge. Quantum Soup Studios, based in North Wales, who are currently designing a Welsh-language role playing game for PC and console with backing from the Welsh Government among other projects. Static Shell Studios – fresh from taking part in this year’s Wales Comic Con in Wrexham, Static Shell will be demonstrating Sunburnt – a multiplayer zombie survival game. Round Squares Studios – Round Squares will be demonstrating their 1950s Steampunk action-adventure game Beyond Arm’s Reach. Warrington based studio, Freesphere Entertainment, bringing their sci-fi horror game, Tether. Vivid Virtual Reality, who specialise in the digital reconstruction of historic Welsh locations. Gaia Technologies who, specialise in serious games and support for innovative classroom education technology. Hashtag Marketing Ltd, who will be demonstrating cyber security technology and a range of games hardware. Senior Lecturer and Programme Leader for Computer Game Development, Immersive Technology & Creative Computing, Richard Hebblewhite, said: “With exhibits ranging from student work to professional products, this year’s Level Up Wales Expo is set to be the most exciting yet. “This is our third year of running Level Up Wales – each year new developers join and we have around 30 taking part this time. These developers include student projects and Wrexham Glyndŵr alumni, as well as some of the top regional developers too. 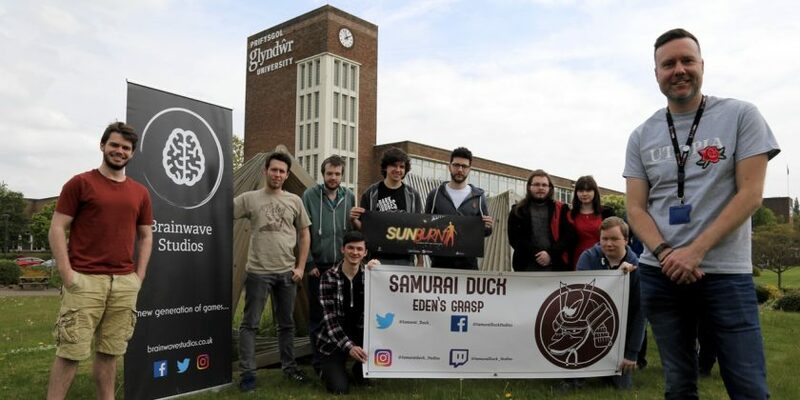 “This year’s event also sees the start of a new partnership between Wrexham Glyndŵr University and the Welsh Gaming Network, who have been working to support and develop awareness of the Welsh games industry since 2016. Level Up is part funded by the Welsh Government and supported by Games Wales, the British Computing Society, North Wales Tech and the Welsh Gaming Network. For more information visit the Level Up website.